For the most part, I think we... in our "Modern Age" here in North America at least, have forgotten the humble beginnings of our ancestors. We now have houses that are thousands of square feet, that house only a couple of people. Yet, it was less that 50 years ago, when people lived in small structures, when families were large, when children never had their own rooms and the things that we have come to take for granted, like hot running indoor water, indoor toilets, automatic washing machines, dish washers, and central heat and cooling did not exist. Certainly many of these things have contributed to public health, which has helped to increase our life spans and basic health. But I cannot help but wonder at what cost, and also at what loss. I don't advocate going "back to the land", but I do advocate a greater appreciation of what we have been given by those who came before us. The kind of family I lived in there would likely have been a murder or two in a living situation like that! 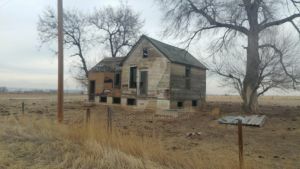 A former boss of mine in Grand Junction Colorado had bought a small piece of property that had an old homestead build on it and still standing. He had a neighbor still living in his family homestead. The neighbor had a kitchen, bathroom, and power. The living room was also the bed room and dining room. My boss lived in a double wide trailer next to the old house on his property. Eventually the old house became a garage which pissed off his neighbor because he knew the history of that old house. It didn't create bad blood or anything, just annoyed the neighbor. There are a few houses on the way to a friend's house kind of like this. I'd love to see if I can get close, but they're fenced off. I like the history you have about these places. It would be great to include it with pictures if you are able to get permission. For sure, it's getting harder and harder to see nice old houses in Colorado. Right now there's three old houses, probably 1920s, that are being knocked down to make room for a while new housing complex. Despite that in good shape those houses are worth a lot more than any of the new houses they only want the property. The size of the lots the old houses sit on they can fit six new houses. I keep wanting to stop and get photos but it's a favorite spot for patrol cars to sit looking for speeders. I may have a chance to see this one more closely one day. The land owners home is only about 50 yards away, sometimes I see them out there. Your photos are gorgeous! This one almost looks like an oil painting... amazing work! thanks for stopping by. Your comment is interesting considering that the original piece is mounted of canvas. Looks like Charles and Caroline left some time ago. My dad grew up in a 10x20 tar paper shack in North Dakota in the 20-30's with 10 people living in it. Income $400 per year, from the cream they sold, the crops were worthless except to eat. He was second generation born in the US. It was not fun. The water was bitter and the climate was the same as Siberia. Not a tree or another farm to the horizon. But it was home to him. Then came WWII and life afterwards got better. The house I grew up in was 576 sq feet. 7 kids, two adults. I don't remember my fathers income, but I know he bought the house and 4 acres for 5000.00. We broke the land and grew much of our food on it. I remember picking berries for jam, preserving tomatoes, planting potatoes and carrots and just about everything else we needed. We also had chickens, ducks, a cow one and pigs for many years. When we moved in, there was no bathroom and no running water. I remember my dad digging a well and a septic holding tank and field by hand. We all had to work. cutting wood for the fire, planting food for the winter, clearing snow in winter. It was not easy, but I was a boy...that is just how life was. You accept it and work with it. We also had a lot of fun. yeah.. we do take all these modern conveniences for granted!!! & i agree w/U that a lot of people forgot how our ancestors lived.... even i will forget time to time. Stunning shot!!! i love that sky!!!! Love the photo! Love your comment. I've seen a lot of my family heritage go through this process. Thanks. I think the experience is common to anyone who has lived past 50. Good example of an old, isolated house, good colors, and the land and sky are beautiful. Small house, but no doubt big dreams once resided there. I don't always think much of 'mcmansions,' all too often they look like oversized development houses instead of having some style, and when that route is taken they (I at least think so) they come out looking rather ugly. Plus, they would need at lot more upkeep than I would probably be willing to put into them, even if I could afford one. I think there is a tendency in our culture toward having EVERYTHING NOW. So people go into debt to buy a new house, a new car and all new furniture. Then they spend their time working to pay for it all. I have never wanted to live that way. We were pretty poor when we got married. An evening out meant about a mile walk to A&W for a hot chocolate. I built our first couch... and it is still here having be rebuilt over and over, and recovered many times. We never bought a full bedroom suite or any suite for that matter. We liked old quality built furniture, so we waited until something came along. Every piece of furniture we have, has a story behind it. And I like that, it connects us to our history. However....nothing matches... but in my mind it all has character and will last and last. I also have never wanted one of these large modern houses. We live in a bungalow, it is not fancy but it served us when our children were home. Now it is too large for us, but selling and re-purchasing does not make sense either, so we stay. Thanks David. As I have said in the past many times... I too wish I could hear those stories. A good name for a book. generator and am on County Electric which is spotty at best in the winter..
before I am hooked up again. I like the idea of living off the grid, but my life has never allowed me to do so....work and other responsibilities. At this point in my life, I think the opportunity has past me by, and I am OK with that. I grew up in the woods of NW Ontario. Some great memories. Electricity seems to be getting more and more problematic. In the past we would go years without an outage. Now it is a regular event. Usually for only a few hours but it happens. We have installed a generator, but at this point it is manual start, and in actuality we have never even used it. But in the even of a long term outage, we can keep the house warm and the fridges and freezers running. There is something about the past that appeals to me. I think it was the fact that people lived closer to the edge, they were more in touch with their environments and understood the risks better.... as well as the pleasures and joys. Some how it seems to me that as we have become less connected and dependent upon the physical world, we have tended to disregard and ignore it more and more. It also seems to me that we have lost some of the joy in our lived by being so isolated from our world and if we are not isolated, so controlling of it. I think it is wise to be cautions of wild animals, depending of the kind of course, but certainly not fearful in most situations. I remember once when I was a boy, a black bear came into our porch. My brother who is two years older than I had to chase it off. I have Bears, they come up my driveway and eat the bird food from my feeders. looking to eat what has been left behind by the others. That is one of this things I miss bout living on the Prairie... not as many animals. I have on the rare occasion seen a wolf out here (There are many further north) I have never seen a bear this far south, but we dod have a mountain lion about 5 years ago. The most common thing is deer... herds of them, and coyotes. I saw a number of foxes last year, and of course there are innumerable rabbits. Raptors (birds of prey) are very common, mostly because we live close to a flight path and see them as they migrate. There is an organization that will begin counting raptors in February. This is a yearly even to monitor the health of the various species. I do not do very much raptor photography myself, and even birds are rare in my work. I do however judge a photo contest each year for the La Riviere Raptor Festival.